We will not provide, sell or lease your personal information to any third party. "I am the proud owner of several paintings by Linda Hartough, and each time I look at one I see something new. For all its realism, her work goes beyond being photographic. Her paintings always convey a strong sense of place, so that you feel, for example, the charm of St. Andrews or the majesty of Pebble Beach. A Linda Hartough painting makes me want to play." "Whenever you see a Linda Hartough golf course rendering, you have to resist the urge to grab a club and drop a ball. Linda has the unique ability to capture, in a single solitary perspective, the very essence of the course itself." "Linda is the golf world's painter laureate. There's a tranquility about her paintings that is absolutely beautiful. When you view them, the paintings have the effect of actually putting you there. They're beyond real." Since focusing her skills as a landscape painter to recreate some of the world's most beautiful golf holes, Linda Hartough has become recognized as one of golf's leading artists. So extraordinary and realistic is her attention to detail that her oil paintings seem to come alive with a clarity that surpasses the camera. Hartough's work has gained international fame. She is the only artist ever commissioned by the United States Golf Association and the Royal and Ancient Golf Club of St Andrews to do the annual paintings and prints for the U.S. Open and British Open Championships. She has painted prestigious golf courses from the U.S. to Scotland to Hong Kong. Her paintings are so admired that they have earned a place on two ABC Television Golf Specials on famous golf holes, hosted by Jack Nicklaus. Her paintings are in the collections of such famous clubs as Augusta National, Pine Valley and Laurel Valley. Hartough originals are also included in the private collections of Jack Nicklaus and Rees Jones. A confirmed artist since the age of six, Hartough was raised in the picturesque countrysides of Wilmington, Delaware, and Louisville, Kentucky. Much of her early career was spent in Chicago where, after receiving her Fine Arts degree from the prestigious School of the Art Institute of Chicago in 1970, she made a living by selling her paintings locally. 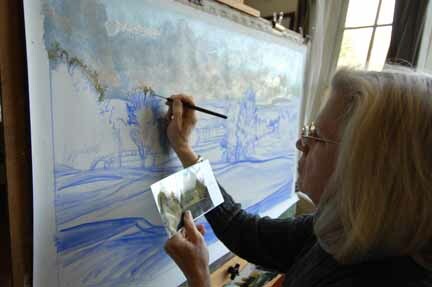 In 1980, she moved to South Carolina near Hilton Head, where she painted landscapes, portraits and horses. In 1984, Augusta National Golf Club commissioned Hartough to paint the famed 13th hole, thus beginning her golf landscape career. After an enthusiastic response to her work at the 1988 PGA Merchandise Show in Orlando, Florida, she focused her career entirely on golf landscapes. Since that time, Hartough's work has enjoyed unparalleled status in the golf world while receiving international acclaim, including Golf Digest's "Lifetime Achievement Award." She is a Founding Trustee of the Academy of Golf Art, a professional society of golf artists established in 2004 to create awareness and appreciation of golf art as a valuable segment of fine art. Hartough's approach to capturing a great golf hole is to spend a week or more at each course, taking photographs at different times of the day to capture all possible light features. She then determines what is important or memorable in each view of a hole and expresses it in the painting. Her memory serves as a less objective image of the hole. The combination of the two provides the unique view found in each of her paintings. "I really enjoy painting golf landscape,” Hartough said. “It is some of the most beautiful and varied landscape in the world, combined with a deep historical sense of tradition that transcends time. “The painting is a success when both elements emerge." As a capstone to her remarkable career, in 2017 Hartough was inducted into the Low Country Golf Hall of Fame. © Linda Hartough Golf Landscapes. Website by Hazel Digital Media.